I’d been soured on Frederiksbjerg because it’s where his lordship and I lived before we’d bought the apartment from hell. His apartment, while it proved to be a good investment, was on the edge of Frederiksbjerg in a noisy and mostly renter-occupied building. It was technically in the city centre, but not really. It took forever to walk downtown and it wasn’t a particularly attractive area. 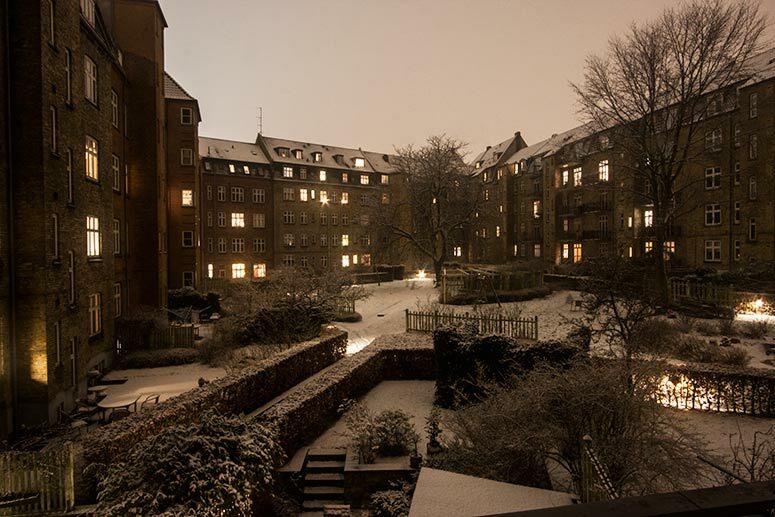 Our apartment block had been built as affordable housing for dock workers in the 1930s and even after I’d decorated it I thought it was a depressing place to live. But that wasn’t representative of Frederiksbjerg and while I’m still a fan of the Latin Quarter, I finally understand why this is the most desirable area of Aarhus. In the beginning, I had a hard time facing this nearly empty apartment. The reality that I was alone and starting over after selling most of my things because I’d thought I’d found my life partner and that my future was finally decided (give or take) was unnerving to say the least. Between that and having lived in a construction zone for almost a year, I was tempted to go on a shopping binge just to be able to live in a finished apartment. But that’s not my style and I’m not going to rush through this. I’ve spent nearly four years conceptualizing and decorating for someone else’s taste, now I need some time to figure out exactly what my taste is these days. So this apartment is very much a work in progress and I’m ok with that. I know for sure that my approach to decorating has changed quite a bit since I first moved to Denmark. 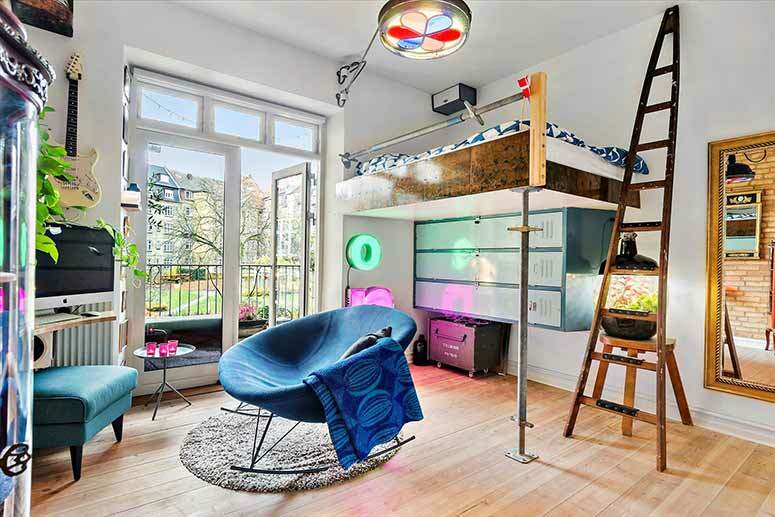 In my first Danish apartment, I was all about crazy colors (remember my pink living room and my purple hallway?). The Scandinavian aesthetic has rubbed off on me over these past (nearly) eight years and now I’m all about creating hygge in my home because it’s an nice way to live and it’s pretty much the only way to survive the long Danish winters. In this iteration of my life, I’m going with white walls in all but the kitchen and I’m using feminine accent colors of predominantly green and pink with some turquoise, blue, and yellow here and there. The woodwork throughout my apartment is painted a gloss cream color and I’ve decided not to repaint it. It’s on the ok edge of having been painted too many times, but another coat or two of paint will not do it any favors. Having stripped over a hundred years worth of peeling paint off the trim in the apartment from hell, I’m happy to sit this one out. The paint is chipped in places, but these imperfections are what made me fall so madly in love with this apartment… unheated stairway bathroom, chipped paint, and all. My loose decorating plan is to keep it minimalist, combining some original Danish mid century modern furniture with other secondhand finds and a few new things here and there. Given free reign, I don’t think my home will ever not be eclectic. Fun, but not not my idea of hygge bedroom decor, and there was OMG so much patching to be done! I actually feel like my kitchen is more finished than my bedroom, but getting cushions for the breakfast nook has been a challenge. I’ll write more about that when (if) they’re finally delivered. The cushions are kind of a big deal in my decorating scheme so I’d like to have them before I post photos of my kitchen. 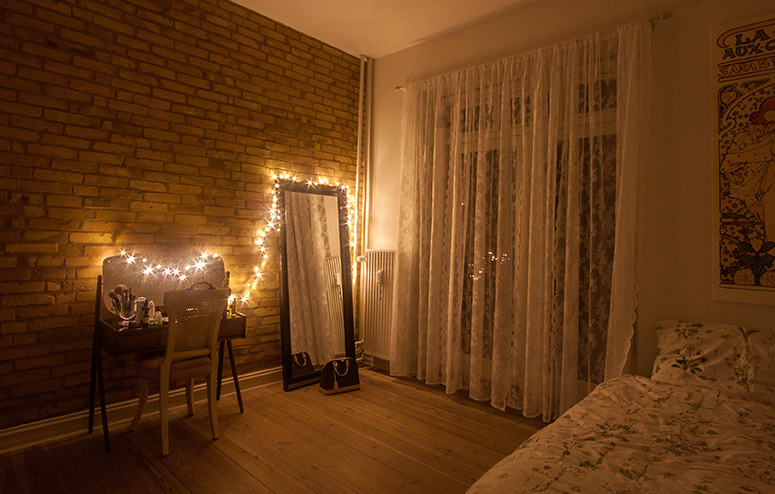 In the meantime, here’s a peek at what I’ve done so far to create a hygge bedroom atmosphere. I don’t have any further concrete decorating plans for this room. I’m just waiting to see what turns up in the secondhand shops and the flea market around the corner. I might get a rug… or I might not. I kind of like not having a lot of things. When I lost a gorgeous mid century modern teak bed in the divorce, I’d considered splurging on this romantic handmade iron bed to replace it. I’ve always wanted an antique metal bed, but they tend to be odd sizes. In the end, I chose the simplicity of a low bed crowned by a large (70 cm x 150 cm) piece of art. I think a low bed with a bold piece of art is a great alternative to a traditional headboard, especially in small rooms. I’m pretty sure a headboard would’ve looked wedged into the space. As it is, my 140 cm mattress just fits. 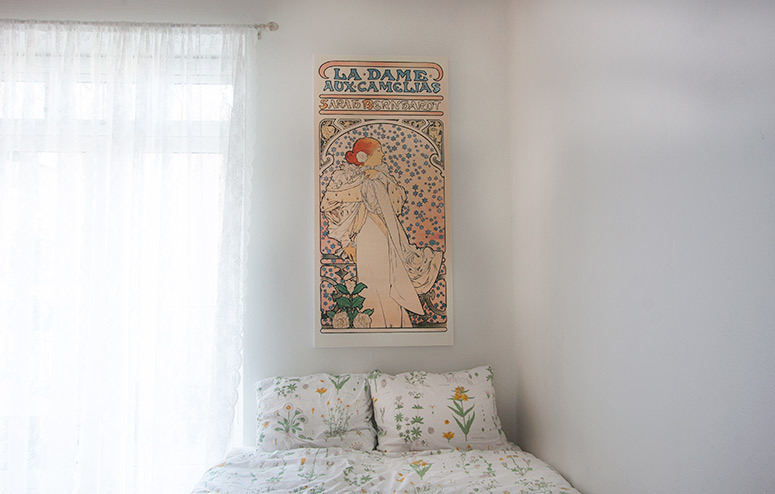 This canvas print, La Dame Aux Camélias by Alphonse Mucha, was a housewarming gift courtesy of the folks at photowall.com. The original was painted in 1896, but I think it has a psychedelic vibe that reminds me of the lady on the front of my mother’s Herbal Essence shampoo back in the ’70s. It also reminds me of Jim Morrison’s Ghost Song lyrics… I think the stars look like the dreams she’s shaken from her hair. As I looked through the (literally) thousands of wall murals and canvas prints on photowall.com, I wanted so many of them. But once I stumbled upon Mucha and then this particular print, there was no other option. There’s something goddess-like about her, the flowers tie in nicely with my bedding, and the colors go well with my feminine color scheme. It’s the perfect print for this space, and for me right now. Photowall.com prints all of their artwork to order so you can choose pretty much any size you want, you can even have your own image printed as a canvas or wall mural, or work with them to modify an existing piece of art. I was afraid that this print would would be borderline too big, but I’m glad I didn’t go any smaller. IKEA’s retro Strandkrypa botanical print bedding was love at first sight and it really does get softer with every wash, as promised. The botanical pattern ties in nicely with my balcony garden and it reminds me of a set of sheets my mother had in the late 70s. I even bought a spare set for when this one wears out because you just know it’ll be discontinued by then and selling for like $500 on Ebay! If you love it as much as I do and don’t live near an IKEA, it’s available on Amazon (affiliate link). I need a couple more pillows and I’d like to find another piece of art, or maybe a series of three or so botanical prints for the wall next to the bed. Hopefully I’ll get lucky in the secondhand shops (with art, not pillows). In the meantime, I find this light and uncluttered room to be calming and restful. It’s also a great space for yoga. Last week there was a meme going around Facebook about Millennials not using top sheets on their beds. This was a very divisive issue among my friends. I had no idea that people were so passionate about their top sheets. The usual bedding configuration here in Denmark is a fitted sheet and a duvet. Sheets are sold as a single fitted sheet and I don’t think I’ve ever seen a top sheet for sale here. In fact, IKEA doesn’t offer their “sheet sets” in Denmark, only fitted sheets. I stopped using a top sheet the day I moved to Denmark and I’ve never looked back! My makeup table is an original Danish mid century modern piece designed by Arne Vodder (more photos here) and the chair is the last surviving piece from a vintage 1950s bedroom set that I bought at auction in the late ’90s. I also have a whole wall of floor to ceiling wardrobe space, which has been reconfigured to give me dedicated areas for skirts, dresses, coats, and shoes. For a tiny apartment, this place has plenty of storage space and shockingly never feels cluttered. Lace curtains always make me think of Gypsy by Fleetwood Mac, and of playing “bride” when I was about seven and blissfully naive about everything. As long as I’m single I’ll always have lace curtains (and maybe some paper flowers) somewhere in my home. I especially love when the breeze blows through them in the summer. My Alvine Spets curtains, also from IKEA, are the same style as I had in the bedroom in my first Danish apartment. I’ve hung two sets because the french doors out to the balcony are wide and one set looked too skimpy. I like that they give me a bit privacy without completely closing off the room from the balcony and courtyard. I have a roller shade for when I want complete privacy. If you’d like a little Gypsy vibe in your life and don’t live near an IKEA, these curtains are also available on Amazon (affiliate link). There’s a chandelier, which you can’t see in the photos, but I mostly use the fairy lights and candles to create this hygge bedroom atmosphere. Once the sun starts making a regular appearance (it’s actually snowing today) I’m going to buy some plants. I’d love to have an apartment full of plants, but Opie likes to eat them so I’m going to have to limit myself to the hanging variety. A bathtub in the bedroom? Given my sketchy shower situation, I’m in the logistics stage of considering installing a small clawfoot bathtub where the mirror is. The kitchen is on the other side of the wall so plumbing won’t be an issue. I’ve found a small tub that can be shipped over from England. I’m going to tape out its dimensions on the floor to see if I can live with the loss of space. With my entire apartment being only 62 square meters, every bit of space counts. But… bubble baths!!! What do you think of putting a bathtub in the bedroom? Great idea or a white elephant in the making? Love the minimalist decor – I am still struggling! How do two duvets on one bed look? Doesn’t it look ‘messy’? Having one’s own cover is especially nice in the colder months – I don’t feel a draft when my husband readjusts himself, but we do it with – two top sheets and one duvet!! Hmmm, a bathtub in the bedroom…I’m sure you will pick a gorgeous one. And, the deep ones that allow you to sit up aren’t even that big, so I am not against it! Thanks, Sung. I think it’s a bit too minimalist at the moment, but I didn’t move in with much and I’m being brutally picky about what I choose to bring in so this could take awhile. The two duvets do look messy. I understand the logistical benefits but I cannot get onboard with how it looks. Even hotels have the two duvets. Two top sheets? Where do you tuck them in? Do you have two mattresses? It’ll be a small slipper tub (most likely). Fortunately, I’m tiny. My heart stopped for a little bit when I saw your make up corner. So charming! Loved the Hendrix song thank you for sharing …very inspiring! I think part of the reason this apartment feels so small to me is because the one I just moved from was cavernous and had 6 foot tall windows and two big rooms connected by double doors. And the bathroom isn’t really part of this apartment, which makes it seem even smaller. But that’s city living and I love it! I don’t really need more space for just Opie and me. LOVE the art! LOVE the bedroom! LOVE the idea of a bathtub in your bedroom, I mean, c’mon! We are also people who do not use top sheets. Thanks, Sandi :) I love the idea, too… you know it’s coming! OK, Sage, off & on, I’m back tho’ wish I could make myself be invisible… And as you know already I know I am not you, but taken aback when I saw “A Peek” in your post title, because just before I arrive here, I am thinking to myself, I’d like to say thanks to Sage for giving us a peek into her life adventures so we can live somewhat vicariously re: paths not taken…. Then you mention your practical plumbing idea that would have the tub in the bedroom. YES! 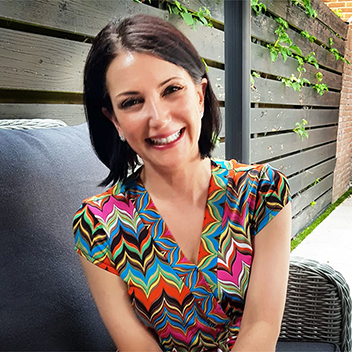 When I was a teenager I wanted to be an architect, but as the only girl in the architecture class, (as well as other classes I took, but there as top student, my other teachers were egging me on to do something more with my life than what was expected at the time…). my architecture instructor asked me to kindly withdraw… But my dream house I designed back then was very simple and small and included a clawfoot tub in the bedroom… Because a bath is just that important! But tubs are probably not the norm in Scandinavia? So since you are not me, you may feel free to decide against, but do float the idea of relaxing into a tub of effervescent bubbles to soak all worries away before crawling toasty warm (& clean!) into bed for a good night’s sleep?!? And just because you have a bathtub in your room, you don’t need to have your toilet next to your bed, which I actually have seen! More than once. Which I understand, but it is more than offputting. Your Mucha print sounds amazing and I love the story. I sincerely hope it’s still there and that you manage to get it back. Let me know? As per usual, I am somewhat hating my comment left — as in, PHFFTT! Just who do I think I am?! ?… BUT — have to know about your experiences with your bathtub in bedroom… Since I never actually did it in real life myself? So looking for updates. 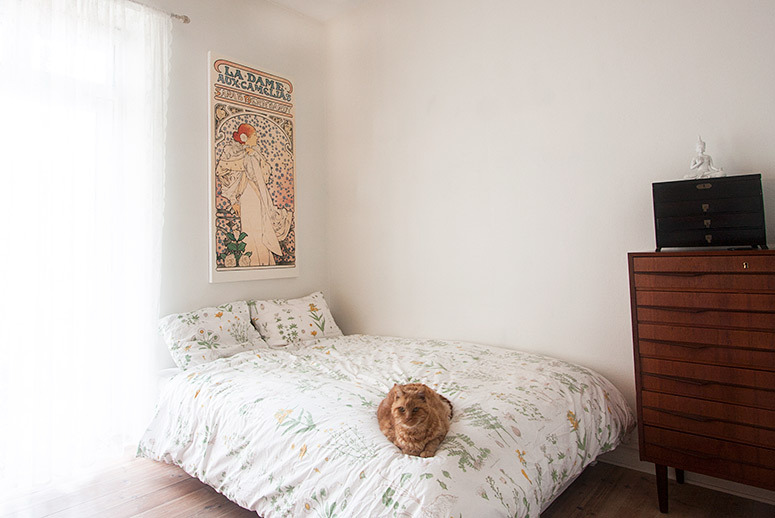 To give you an update… Went to check, the MUCHA is there yet at the home. Just lost in all the clutter. But as she as the one who years ago actually helped these people (for me they are just fond memories of people I once knew), with her it deserves to stay as a reminder of good deed done despite the risk. I LOVE your “headboard”, to say the least. Have you seen the one he did with the cello player? I almost think I have to have it — love the cello as an instrument — but do I really? Sad to say have never seen that one again since the first time witnessed despite some searching. Hope things are going along well in your world today. Take good care. P.S. If I am reading the dimensions correctly, your apartment is the same size as my first owned house, it was a fixer including complete bathroom with tub & shower & sink & toilet… Cozy, but you can do a lot with that. Bathtub in a bedroom is awesome… We have been remodeling an 1860’s Victorian home in upstate NY for almost two years and in our downstairs bedroom we have just added a stand alone tub and it looks amazing in the room. At first we were hesitant but after seeing so many online pictures we decided to do it. Now mind you we have an old claw foot tub in our upstairs bedroom and a very large duel shower in the main bath. I would also like to tell you that the light that shows in your bedroom looks very warm and cheerful. Keep posting pictures and progress I am sure we will all enjoy the finished product. I really lucked out with the light in this place, and I can finally see the moon again! I haven’t been able to see the moon from my window in almost 4 years. I’ve missed it. 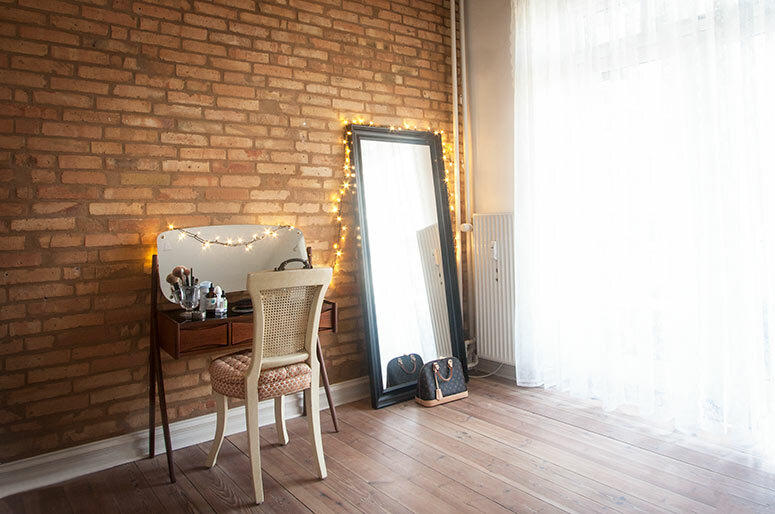 So pretty and charming…the fairy lights (and Opie) make it comfy-cozy perfect. Love the hygge vibe in your calm, peaceful and feminine bedroom! Most importantly, it’s yours. Perhaps you really do need a small clawfoot tub like one I spotted on Chateau de Gudanes’ IG account. Will post the photo on your FB page for you to see. I love how the LV bag is admiring itself in the mirror! Growing up, we had a clawfoot tub in our center hall. My mother put potted plants in it. It was definitely a conversation piece. Yes, yes, yes to the tub in your bedroom!! What a great idea. So your square footage is almost 670 square feet. In NYC that would be considered plenty of room ;). As always, I love what you’re doing with your apartment. It’s airy, calming, and cozy. Such beautiful light from your enormous windows. The Christmas lights make it feel so homey.